Philosophical Transactions of the Royal Society B. 367: 2852–2863. Finch trichomonosis, caused by the protozoal parasite Trichomonas gallinae, was first recognized as an emerging infectious disease of British passerines in 2005. The first year of seasonal epidemic mortality occurred in 2006 with significant declines of Greenfinch Carduelis chloris and Chaffinch Fringilla coelebs populations. Here, we demonstrate that large-scale mortality, principally of Greenfinch, continued in subsequent years, 2007–2009, with a shifting geographical distribution across the British Isles over time. 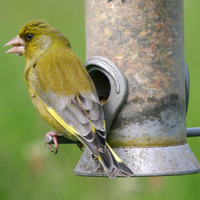 Consequent to the emergence of finch trichomonosis, the breeding Greenfinch population in Great Britain has declined from ca 4.3 million to ca 2.8 million birds and the maximum mean number of Greenfinches (a proxy for flock size) visiting gardens has declined by 50 per cent. The annual rate of decline of the breeding Greenfinch population within England has exceeded 7 per cent since the initial epidemic. Although initially Chaffinch populations were regionally diminished by the disease, this has not continued. Retrospective analyses of disease surveillance data showed a rapid, widespread emergence of finch trichomonosis across Great Britain in 2005 and we hypothesize that the disease emerged by T. gallinae jumping from columbiforms to passeriforms. Further investigation is required to determine the continuing impact of finch trichomonosis and to develop our understanding of how protozoal diseases jump host species. Visit the journal website for access to the full paper.